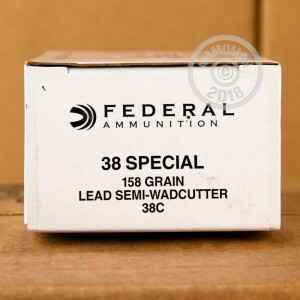 This .38 Special ammunition from Federal comes in a bulk priced 1,000 round case ideal for high volume target shooting. 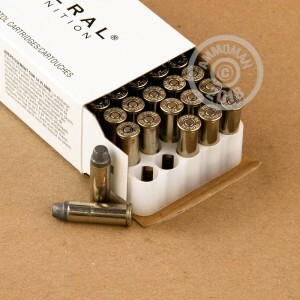 These cartridges are especially well suited to paper slaying, as they fire flat nosed semi-wadcutter bullets that punch clean holes in paper targets for easy visibility from the firing line. Each cartridge in this case fires a heavy 158-grain LSWC (lead semi-wadcutter) projectile at a muzzle velocity of 760 feet per second. This low velocity does not sacrifice accuracy at close range but results in relatively low recoil for faster recovery between shots and reduced fatigue. Note that not all ranges (especially indoor ones) allow the use of unjacketed ammunition. These cartridges are loaded at Federal's headquarters in Anoka, Minnesota using non-corrosive Boxer primers and reloadable brass cases. 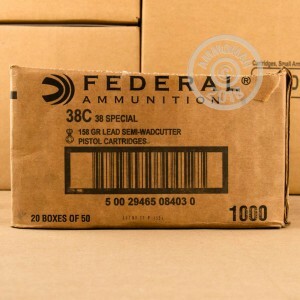 Grab this case or any other ammo priced at $99 or more to get free shipping from AmmoMan.com--it's an easy way to save!